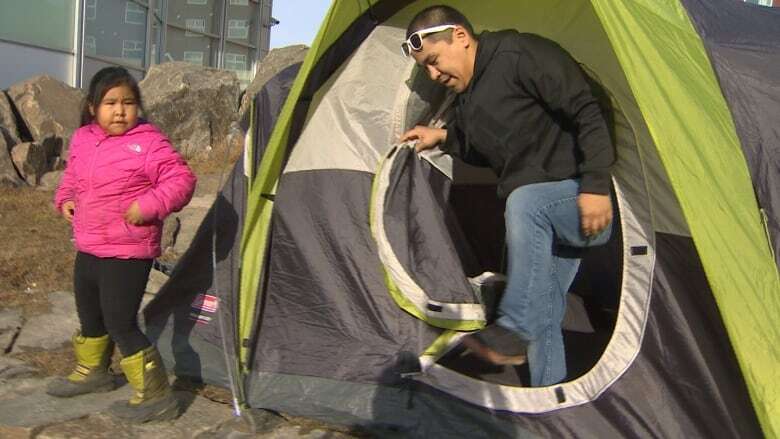 Brian Tagalik has been staying in the tent since Sunday with his partner Pitsiulaaq Ashoona and their two little girls. 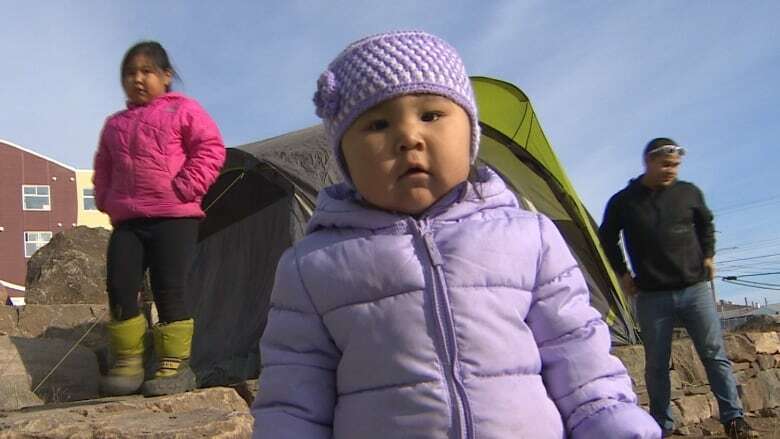 Brian Tagalik says the hardest part about living in a tent with his family in front of the Nunavut legislature is explaining it to his seven-year-old daughter. "On our way there, she was crying and I was in tears and I was scared. I wasn't sure how I was going to take care of them," Tagalik told As It Happens host Carol Off. "She was reluctant at first, but [I was] telling her that this was going to be the hardest part. As soon as this was over, someone's going to help us. Someone has to help us. This is our territory. We are Inuit. We are educated." They're using a Coleman stove to stay warm, as temperatures drop below zero overnight and the winds blow as high as 60 kilometres an hour. "Why is it we have to do this and get ourselves on this level and freeze ourselves each and every night and explain to our children at the end of the day that maybe we're not worth it? Maybe we are not worth our government reaching their hand out to us? Maybe we are aboriginal. Maybe we aren't worth it. And that's painful," he said, stifling back tears. In 2017, the federal government earmarked $24 million annually to help construct new housing stock in the territory. With that funding, Nunavut's housing corporation estimates it will take over 60 years to construct the thousands of homes required to meet people's needs. Meanwhile, rent in Iqaluit is among the highest in the country, with the average for a two-bedroom coming in at $2,597 per month, according to the Canada Mortgage and Housing Corporation's 2017 northern housing report — far beyond Tagalik's means. According to the report, two thirds of Nunavut's population rely on housing assistance from their employer or the government. Tagalik's family is pursuing both avenues. Ashoona works five days a week for the territory's health department, but she's only classified as a relief worker and isn't qualified for employee-assisted housing. In an emailed statement, the Nunavut government said it has met Tagalik's family and is working with the housing authority to "to identify ways to support the family." 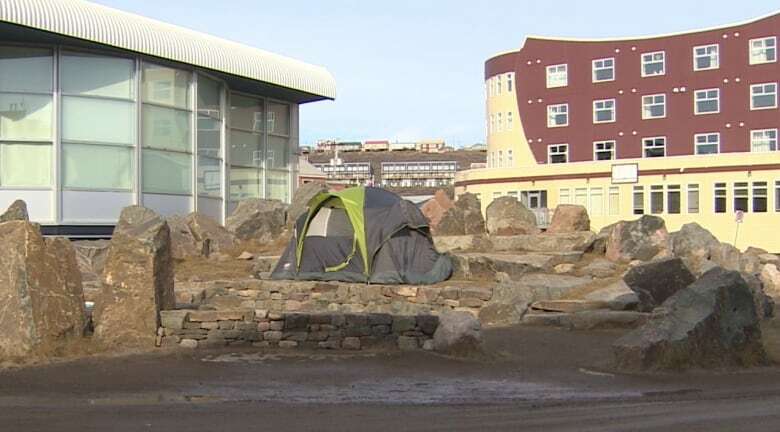 "There is chronic shortage of housing across every community, and the Government of Nunavut is working hard to develop solutions with limited resources," reads the statement from the office of Elisapee Sheutiapik, Nunavut's minister responsible for homelessness. "Government is working to strengthen shelter services for Nunavummiut experiencing absolute homelessness and those most at-risk. This is not something that can be accomplished overnight, but it is a priority for the Government." The tent, Tagalik said, was a last resort, after four years of couch surfing with friends and family. "We've always told each other when we go from house to house until we're left in the street: maybe we have to put up a tent," he said. "And we put it off because of fear of what people were going to think of us." On Sunday night, when their last temporary situation fell through, they decided to bite the bullet and prop their tent where everyone could see it. "I was tired. There was nothing else I can do. And the embarrassment of waking up on the legislature in a tent was less than the pain of taking my family at 2 or 3 in the morning from another house," Tagalik said. For Ashoona, moving into the tent was almost "a relief." "Living in someone else's house that's not ours is really difficult, you know. Like, we don't have any authority or say in how to be," she said. Tagalik said he knows people in town are gossiping about them and posting negative things on Facebook. But he said he had to swallow his pride for the sake of his family. "As an Inuk man, learning from my father, I can live in a car. I can live in a tent. I can survive on almost nothing. But when I've got children, they deserve a safe place," he said. "And when that wasn't being delivered and provided to my children, I knew there was only one option and that was to put my tent up there and say: Look, we aren't bad people. We are Canadian citizens. We deserve the very same rights you can find anywhere south of Nunavut." Written by Sheena Goodyear with files from Chris Harbord and CBC North. Interview with Brian Tagalik and Pitsiulaaq Ashoona produced by Chris Harbord.